Kensington is a dynamic suburb with a large population of students, rentals, and bustling businesses. Luckily, Randwick Electrical has the experience to keep up with a diverse range of needs and situations that may arise. Trying to attract students to a rental in Kensington? One thing is for certain: university students rely on their electronic devices, perhaps more than any other group! If your switchboards are outdated, however, then electronic equipment and gadgets may be at risk from an unexpected power surge. Don’t be liable for damaged electronics! If your building is older, having the switchboards inspected is the responsible choice that may save you money (and headaches) in the future. 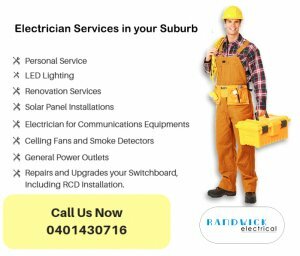 Switchboard upgrades are a relatively cheap and hassle-free update to your building with a little help from Randwick Electrical. Before you advertise, make sure your building is fully equipped to handle the demanding electrical needs of today’s students. Maybe you’re hosting an art gallery opening or planning a neighbourhood block party. If you’re going to address a large group of people in an outdoor setting, you need great audio/visual backing you up. Our Kensington electricians can take the guesswork out of audio/visual equipment so you can focus on what truly matters: engaging with everyone who attends your one-of-a-kind event. In a busy suburb such as Kensington, sometimes homeowners can feel a little more secure with sophisticated outdoor lighting choices. A little advice from the professionals can go a long way before you install or renovate lighting on your patio and garden. We can bring you up-to-date services, including energy saving options. If you’re looking for a reliable emergency electrician in Kensington, look no further than Randwick Electricians. We extend a warm welcome to all businesses that serve our students in Kensington. Being a business owner is tough, especially when you’re serving a student population that might be a little strapped for cash. At Randwick Electrical, we know that an electrical emergency can be devastating to a business. That’s why, when you choose Randwick to be your emergency electrician, we provide upfront quotes and get the job done quickly.